I thought the other day: "What would it be like to be an artist in New York City?" Now, I'm not an artist. I've only been to New York City once and it was completely overwhelming. I was really asking myself: what if I were someone different? I guess I wondered if I would be the same person, have learned the same lessons, or even been on the path I am now? I sometimes wonder if I would have learned about love, joy, peace, and patience without children? Sometimes we mothers say "Of course not! I would have never learned these lessons without children..." We look at single women and think "How selfish." We look at women without children and think, "How free!" We pat ourselves on the back and say "I am so glad for my children, they have taught me so much." Although this is true, it is NOT true that God cannot teach these lessons without children. God can teach you about love, joy, peace, and patience without children just as easily. Women living with their parents. It doesn't matter - God still teaches you. We (I) need to be careful not to judge others. I cannot know what God is teaching the young woman down the street who longs for a husband. I cannot know what truths are written in the heart of the older saint sitting on her porch at night. I may never know all the heart-change that goes on in the lives of those around me. 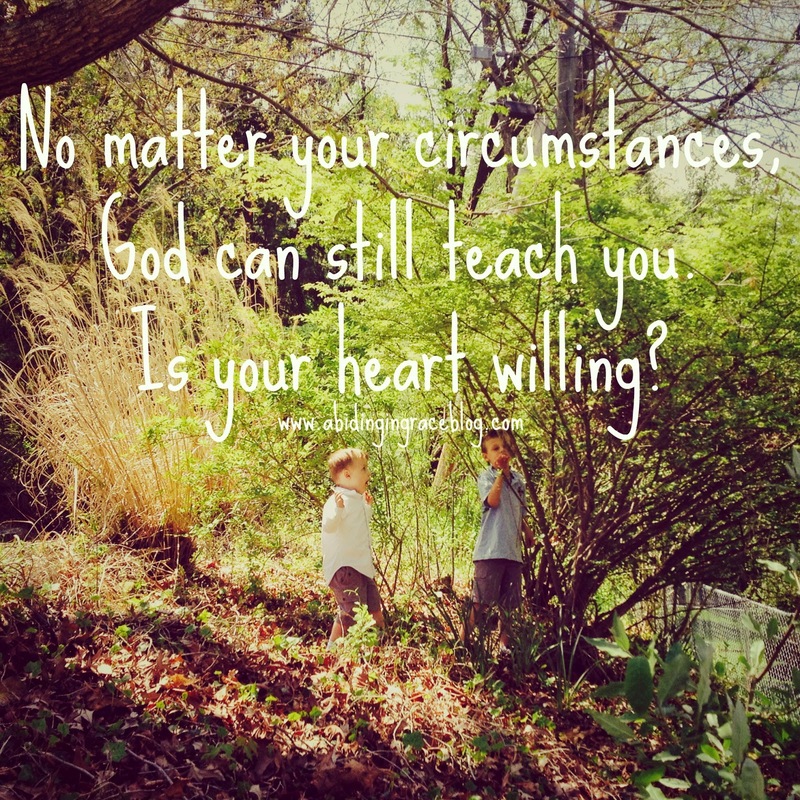 God teaches us all - no matter the circumstances. Mine just happens to be "married with children while adopting." God can teach a single young women about joy, love, peace, and patience just the same! That is the beauty in His Word. That is the comfort in His promises. That is the hope we have in Him.